Do you like to find and share your location and GPS coordinates to someone you are trying to meet ? A simple application that allows you to share your position via email, text messaging, twitter, Facebook etc. It also displays the accuracy of your signal, and time since you last received a valid GPS signal. Useful for when you just want a simple position fix or want to determine GPS dead spots. Glympse is a popular location sharing application and a great alternative to Google Latitude. 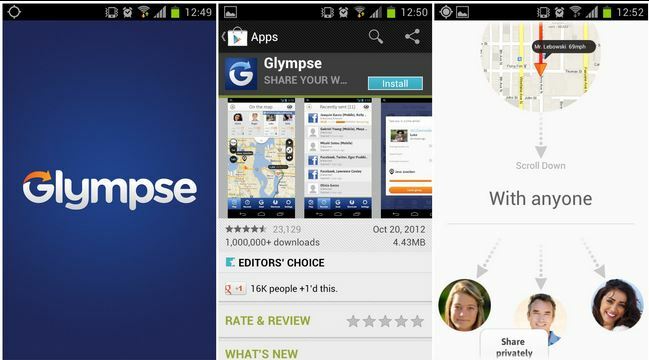 Glympse is the easiest way to safely share your location with someone in real time. No sign-up needed and no new social network to manage. Recipients receive a link allowing them to view your ETA and location in real-time for the length of time you choose. When the timer on your Glympse expires, your location is no longer visible. Best part of this application is recipients do not need any special software to view a Glympse user location. Send a Glympse via SMS, email, Facebook or Twitter, and recipients can view it using any internet enabled device. Download Glympse for Android on your device and make sure your GPS is turned on. Then open Glympse and go over the tutorial. Hit the start button for share your location.